MILFORD Indiana (U.S.A.) - Brock Grain Systems has developed a SWEEP-TRACKER® Control System that, when retrofitted to older Brock MODEL ABC™ Silo Sweeps or purchased as part of a new Model ABC Silo Sweep, provides the first true zero-silo-entry sweep product for the grain storage industry. The company’s SWEEP-TRACKER System could revolutionize silo unloading for large commercial operators by freeing employees from the need to stay with the sweep or the silo during the unloading process. With the average unloading process taking from 11 to 18 hours, companies may start seeing some savings right from the start. 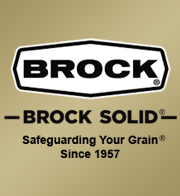 Brock reports that some SWEEP-TRACKER System sales have been to grain facilities that have the potential of loading and unloading storage silos every week. Brock’s MODEL ABC Silo Sweep allows flat-bottom silos from 6 to 60 meters (20 to 200 feet) in diameter to be unloaded as efficiently as hopper-bottom silos. When outfitted with the SWEEP-TRACKER Control module, the Brock sweep can be monitored for location within the silo, percentage of grain remaining, and more. In addition, the SWEEP-TRACKER System controls the drive and slows or even stops the sweep when it is flooded, saving on energy and equipment wear as well as extending service life. When coupled with programmable logic controllers (PLC) in use at many of today’s modern grain storage and handling facilities, the new Brock SWEEP-TRACKER Control System allows facility operators to completely automate their silo unloading operations. And depending on the age of the sweep, kits are available to retrofit certain older ABC Sweep models as well.